Brown rice is the healthiest rice because it is not processed like white rice. Restaurants should offer this to their customers as a tasty alternative. A simple meal of rice, gravy and meat is a fan favorite. Mars Foodservice Uncle Bens Whole Grain Brown Rice 25 lb. 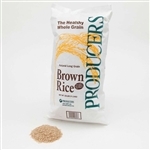 Producers Long Grain Brown Rice Four Percentage - 25 Lb. Uncle Bens Roasted Chicken Flavored Brown Rice - 24.4 Oz. 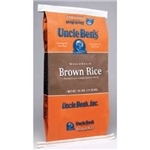 Uncle Bens Asian Style Brown Rice - 26.49 Oz. Parexcellence Quick Cooking Whole Grain Brown Rice - 25 Lb. Foothill Farms Whole Grain Spanish Brown Rice - 36 oz.